The £10m public liability insurance is in place and the ‘Friends of the Umbrella Tree Ltd’ has been officially formed. The Friends are now waiting for the Isle of Wight council to respond. We have received some wonderful news about the Umbrella Tree. We have been trying to take over the tree to preserve its remaining life, but could not do so unless we could obtain Public liability insurance for ten million pounds. The insurance company contacted us on Thursday and confirmed that we have the policy in place. We have also had plans drawn up by a structural engineer and The Forge at Whippingham are going to construct the frame for us. We are now officially a company called ‘Friends of the Umbrella Tree Ltd’ and we have contacted the Isle of Wight Council to formally request the take over. 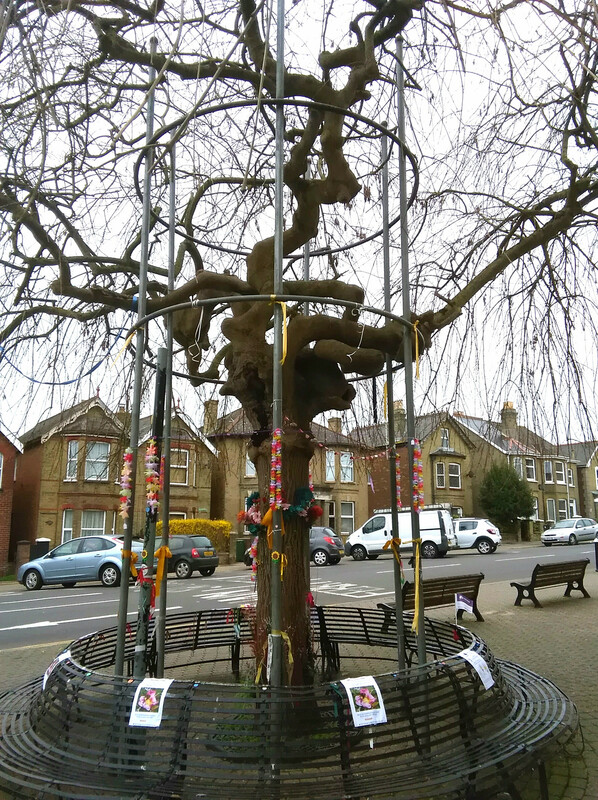 The iconic umbrella tree which is over 100 years old was planted by Queen Victoria’s road foremen as a part of the plan for East Cowes and is such a landmark in East Cowes. It is so close to the hearts of the people of East Cowes and a recent petition attracted about 4,000 signatures. We have had several get-togethers around the tree and everyone who attended were so enthusiastic and supportive. 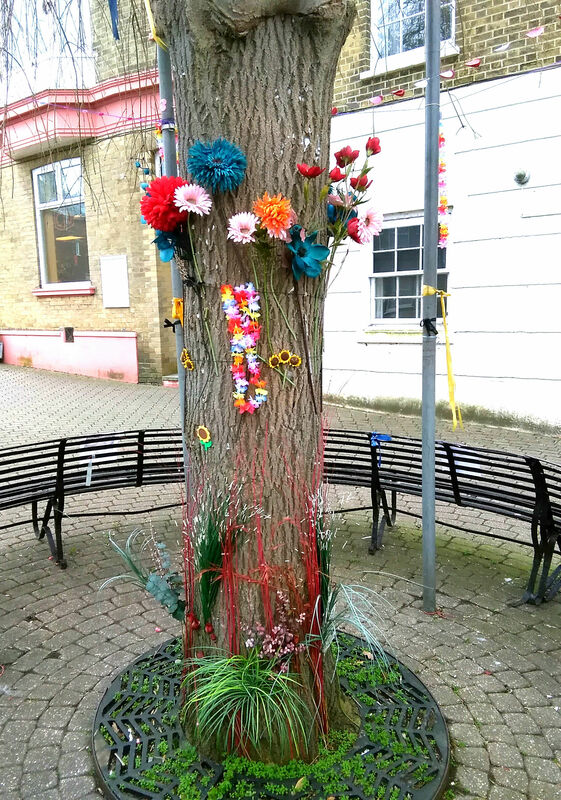 It was wonderful to be able to give everyone the great news on Friday at the ‘Tree in Bloom Flower Power’ get together where the tree was bedecked with artificial flowers and looked lovely. 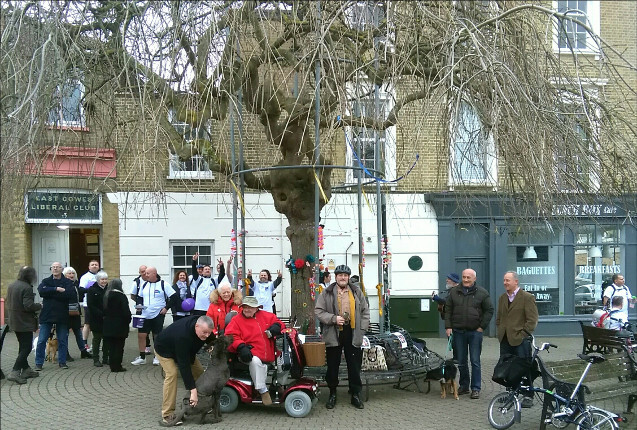 We toasted the tree and handed round the biscuits and were entertained by two buskers. We are just waiting now for written confirmation from the Isle of Wight Council that the tree is ours. 1 Comment on "Umbrella Tree insurance in place for takeover by community"
Brilliant news. Well done everyone !